This Post has already been read 1538 times. 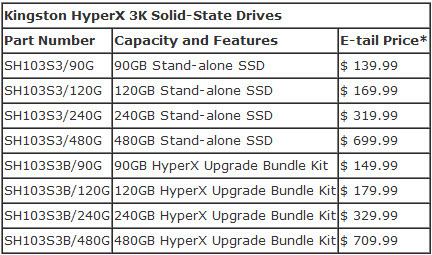 Following the HyperX MAX 3.0 and HyperX SSD, Kingston launches the new Hyper 3K solid state drive intended to deliver high-performance at a lower price. As he company said, he series is ideal for budget-minded gamers, enthusiasts, multitaskers, overclockers and system builders. The new HyperX 3K utilizes 2nd generation SandForce SF-2281 processor and uses SATA III 6Gbps interface. 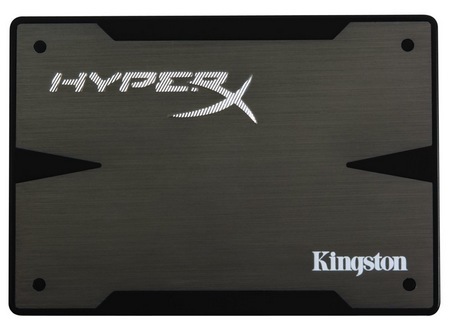 Based on MLC NAND flash, Kingston’s new 2.5-nch HyperX SSD comes in 90GB, 120GB, 240GB and 380GB capacities. It offers up to 555MB/s read and 510MB/s write speeds and a 4KB Randn Read/Write performance of 85.000/74,000 IOPS. It supports S.M.A.R.T., TRIM commands and Garbage Collection as well as SandForce DuraClass for maximized life span and durability. The SSD has a aluminum case and comes in sleek black. Kingston’s HyperX 3K is available as either a stand-alone drive with 3.5-inch bracket or in an upgrade kit that will includes a 2.5-inch USB enclosure, a 3.5-inch bracket, SATA data cable, hard drive cloning software and a multi-it scredriver.